In just six days, director James Cameron’s AVATAR is the top selling DVD/Blu-ray. The film is drawn from Science and Environmentalism. AVATAR director, James Cameron joined a panel of Scientists at The California Institute of Technology (Caltech) yesterday evening for an open discussion on the science, technology and environmental possibilities of the alien planet, Pandora in AVATAR. 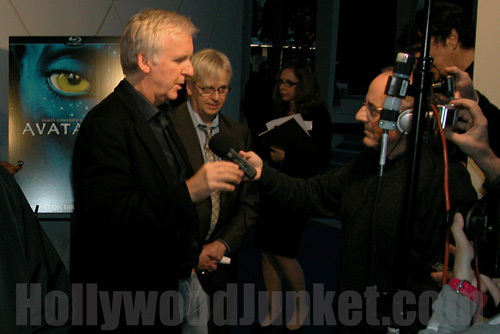 AVATAR director, James Cameron answered scientific questions about life on Pandora at Caltech yesterday. Selected key scenes were chosen to view on the large theater screen at “Beckman Auditorium” at Caltech where the discussion panel took place. As the packed audience and experts along side of Cameron watched the clips played via a PS3, observations in the movie were analyzed for real world relevance. Video interviews below of James Cameron and Scientists. Cameron commented on the fact that Pandora is the closest star system and that there was no warp drive so it felt more in the near future. It would take 5 1/2 to 6 years to get there. He also pointed-out that many viewers of the film have said that the visuals remind them of underwater. Cameron stated that it was based on his 300,000 hours he has personally spent underwater.